On page 19 of the Daily Telegraph of 3rd August 2006, there was a full page advert for 'U.S. Gov't Gold Final Release', but with a few inconsistencies and other points of interest. Rather than create an exact copy of their advert, we will give some of our comments about appropriate sections. Buy Gold Now Before it Reaches £1,000 Per Ounce. Gold Blasts Past £388 Per Oz. In May! Buy Now - Market Could Go To £1,000 per oz. The United States Rare Coin and Bullion Reserve Vault Facility today announces the final release of some of the last 5,000 U.S. Gov't Issued Gold Coins previously held at the West Point Depository / U.S. Mint. For the very first time, British citizens are now able to buy 2005 $5 Gold Coins at an incredible mark-up free price of only £39 each. Am amazing price because these beautiful Gold Coins are completely free of dealer mark-up. That's correct our cost. There is more than a touch of Barnum & Bailey in the manner and style of this "announcement". It looks to us as though the advertisers are trying to create the impression in the reader's mind that they are either the U.S. Mint, or an officially appointed distributor. Right at the bottom of the page, in almost microscopically small print is a statement to the effect that the advertiser is not affiliated in any way with the U.S. Government. Phineas T. Barnum would have been proud of this method of stating the truth but in such a hard-to-notice way that most people would never spot it. As for the price being at nil mark-up, this is not true. We made a call to United States Rare Coin & Bullion Reserve in Austin Texas, and asked for more information. We had to give our name, address, and telephone number before they would tell us more "because that's the way it works". When we asked what gold price the advertised price was based on, we were told that the current price was $730 per ounce, and that the offer was based on the same price. In fact, most of today the price range of spot gold has been $638.60 to $652.95, and fixed at $646.25 in the morning, and $644.40 in the afternoon, and average price around $645. These dollar prices equate to a low of £339.06, a high of £348.24, morning fix £345.164, and afternoon fix of £341.404, and an average of around £343, all prices per troy ounce. 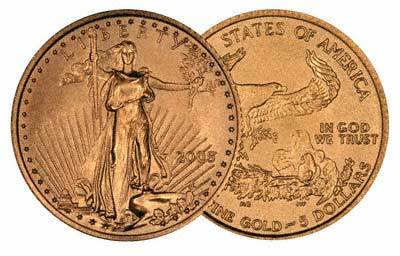 From the U.S. mint, the wholesale price to distributors is at 9% premium, which at today's average spot gold price would make them cost £37.39 each, so at £39 each these coins are not expensive, and 9% premium over $645 would be $70.31 each. Most U.S. bullion dealers however will be selling 2006 dated coins, which is probably what most of their customers want, so we guess that this dealer has acquired some old stock, perhaps bought back from a previous customer or another dealer. Indeed, we have a small stock of several different recent dates, which we were also offering at very competitive prices when we first bought them, and had relatively large quantities of them in stock. We even had a roll of 2005 in stock. If you are interested in investing in gold, then you do not need to specify a particular date, and also larger coins tend to be available at lower premiums, so our advice is often to go for whatever is available in the lowest premiums, usually Krugerrands (one ounce), of British sovereigns, approximately a quarter ounce. Well perhaps it does to some extent, but our usual advice is to buy on market dips, and when the price is lower, rather than in a panic when gold is being hyped up for whatever reason. Although we believe that most people should consider putting some of the assets into gold, it is not true to say that it is always better ti have gold than money in the bank. Between January 1980 and July 1999, gold went down by about 70% in dollar terms, and about 60% in sterling. We don't know if this is supposed to make the reader think that the advert or offer is authorised by Congress, in fact it is the design and issue of the coins by the U.S. Mint which is authorised. The pennies in your pocket are authorised by the British Government! Well, the prices are not quite cost, and there are better deals available. In the advert, the coins are shown 2.25 inches in diameter (60mms), the actual size is about 2/3 inches 16.5 mms), and there is nothing in the advert to make this obvious, although there is a rather vague statement "Specially Enhanced Photos To Show Detail". They don't actually say that the images are shown at almost 4 times their normal diameter, or over 13 times the area! In the advert, the coins are described as $5 coins, but nowhere does it mention that these are only one tenth of an ounce, and to our mind this would be a better description, and easier to understand. Isn't is amazing that the way the photographs of the two sides of the coin are overlaid in the image, that the inscription 1/10 Ounce Fine Gold is neatly and coincidentally covered up and obscured by the other side. 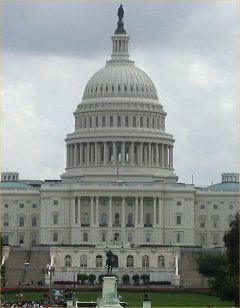 The advert features a 4 inch high photograph of the Capitol Building, a similar view to that in out photograph. So what's this about? Why put this photo slap bang in the middle of the advert, as if to imply that the advertiser is in some way connected or authorised by the U.S. Government? And why is the disclaimer in tiny letters about one sixteenth of an inch high at the bottom of the page? A crude and rather selective block chart from 2000 to 2006 shows gold sharply up against other investments having gone down. If anything, this suggests that you may have already missed out on the best part of the gold bull market, although we actually think there is much more upside potential, but we have being gently urging people to buy gold while it was cheap, when it was only about half its current price. Let's ignore that fact that this sounds slightly ungrammatical. Actually we would agree in general terms with some of the factors cited by this advertiser in favour of investing in gold, although all the only points made are rather one-sided, they don't put any of the counter-arguments. £25,000 in Gov't Gold Coins could be worth up to £125,000 in the future. Fair enough, but a £! lottery ticket might be worth £!0 million next week, our pet pig might take flying lessons, and Saddam Hussein might just be a nice Jewish boy! Why a Minimum and Maximum Quantity? Due to very limited supply, a limit of 10 U.S. Gov't Gold Coins per customer will be strictly adhered to. Order immediately to avoid disappointment. Offer may be withdrawn at any time. Special arrangements can be made for Gold orders worth over £25,000. It makes some sense to stipulate a minimum order to make it worth their while. But why impose a maximum limit? Perhaps this is similar to the £5 coin for £5 offers in the U.K., usually a loss leader to get you hooked, and your address and contact details onto their database, so that they can target you with other more profitable (for them) offers. And why special deals for over £25,000 if there is a limit of 10 coins (one ounce) per person? What the advert fails to state is that you will be charged in dollars, and you will not know how much the sterling cost will be until you get your credit card statement. On the telephone we were told that we would get the best rates from our bank, but we do not know how "Ron" could possibly know this. Most banks and credit card companies charge between 3 to 5% for foreign exchange transactions, and you are presented with a fait accompli, because you cannot re-negotiate the rate once you get your statement. Some companies charge more. A foreign bank transfer may cost up to £40 or £50, plus an exchange rate spread, so it could cost you more than 10% extra for a wire (bank) transfer. Their advert mentions that there "may be" additional costs for shipping and insurance, but fails to state what these charges will be. Apparently it is $41 for 10 coins, and probably the same for only 5 coins. This works out at about £22 at middle exchange rates, so adding at least £2 per coin, and possibly over £5 per coin extra. There May Be VAT Payable! Don't these guys know? Actually there is no VAT payable on investment gold in the UK, although Customs & Excise will try to charge you, as they usually don't appear to know, and perhaps they get commission? Ron though it may be 6% "or whatever you guys pay". VAT in the UK is 17.5%. This lack of research by the advertiser would not inspire us with confidence. 8030 N. Mopac Expressway, Building B-300, Austin Texas. Austin Coins of Texas, or Accent Rare Coins of Texas, both of whom appear to be the same, and have been illegally using our copyright images of Krugerrands without our permission. We will publish, below, any further information we receive.